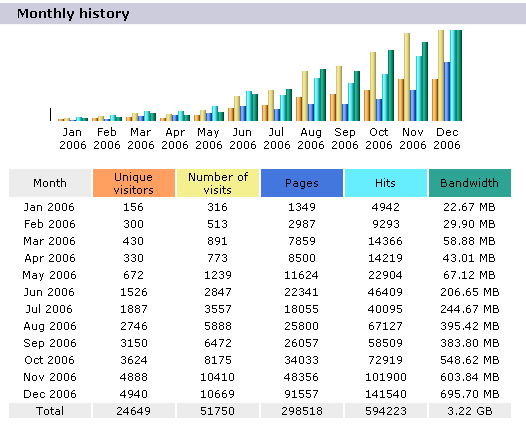 So, the general shape of blog posting around this time of the year is in the form of “my five predictions for 2007” and in discussing site statistics for the calendar year. I’m not going to bother with predictions; but I’m going to walk through my statistic through the year and talk about what I was doing in the way of marketing and how those activities impacted my site traffic. Although any set of site statistics should be taken with a big fat grain of salt, these do seem to show a teensy trend towards more traffic. In the month of January: 156 unique visitors. In December: 4940 unique visitors. What caused this increase? To be entirely honest, it was a bit of careful planning and intentional personal marketing. Let’s be honest: I’m in business doing accessibility consulting and web design, and I though that increasing traffic to this site might help me in pursuit of that goal. In January, I received, as I mentioned, 156 unique visitors. This is generally along the vein of the traffic I’d receive during the previous year as well, based on, essentially, no marketing at all. I’ve been listed in DMOZ for quite a long time, but as of January that was the extent of my marketing activities. In February, traffic doubled to 300 uniques. This was the result of my authoring a brief tutorial on Blogger. Using the interface, etc. Although most of this information can be found on Blogger’s help pages, this tutorial summarized things nicely. It also mentioned explicity information on uploading documents to Blogger: apparently, a very common question. This was my first taste of search-based traffic, really: people finding what they want on your site. March and April get grouped together because I didn’t really do much more with this site during that time. Instead, I started a second site: inter:digital strategies, a search marketing consultancy. I joined Cre8asite Forums and began to maintain a search marketing blog. Both of these things increased my overall industry profile, but didn’t directly associate with http://www.joedolson.com. In May I authored a pair of articles on Boolean searching with PHP (Hypertext PreProcessing) and MySQL, which accompanied a PHP script doing that very task. These were highly strategic: I knew full well that this was a highly specific search query which was currently lacking any valuable search results. I filled it. The articles were posted in mid May: my traffic doubled that month. During the summer months, I continued to let things grow. I began a blog at JoeDolson.com and backfilled it with a few of my older announcements and articles. I continued posting heavily at Cre8asite Forums and in both blogs. I took a month’s vacation (all of July). I moved from Vienna, Austria to Saint Paul, MN. Traffic kept growing, a mixture of the greater search traffic spawned from my PHP/MySQL articles and the higher profile which was gaining valuable in bound links. In August, I became a site grader for Accessites, an awesome accessible design showcase, thanks to the invitation of Mike Cherim. Kept on writing. Ultimately, this is the key: find an article that needs to be written and write it. Overall, this technique caused my traffic to multiply 35-fold over the course of this year. I spent practically nothing on any other kind of marketing: a couple of quality directory submissions which were probably completely unnecessary, but otherwise my only expense was my own time. And what has this meant? At the beginning of the year, my job queries were very slow: I knew a few people who might need websites, and would talk to them and let them know I was available. Every once in a while, I’d receive a cold contact: 90% of this proved to be unqualified leads. This week, I’ve been contacted 7 times so far through my website. Two job proposals, four “thank you” notes for articles, and one offer to become a moderator at Cre8asite Forums. (Thanks, Kim!). No question in my mind: business profile is the key to success on the web. In my industry, this has meant writing useful articles, helping people out through Cre8asite Forums, and letting people know I’m out here. The key has been writing with people in mind: being friendly, approachable, and responsive. Do I think that my writing alone has made this much of an impact? No, frankly. I think the fact that I’ve also made a concerted effort to respond to blog comments, to respond to every query I receive through my contact form, and that I’ve helped people is what’s ultimately been the most effective marketing tool I could wield. The main reason I wanted to post this was because of that dramatic swoop into December…there’s something satisfying about that kind of growth. Don’t know if I want to deal with that kind of traffic. Good job, Joe. Stats are nice in helping to confirm that what you’re up to isn’t going unnoticed. Nice dramatic climb you have going on there. I certainly intend to keep myself busy! You did a terrific job in 2006, Joe. Keep up the good work and the good articles in 2007. I thoroughly enjoy visiting your blog and make a point to do so each day.